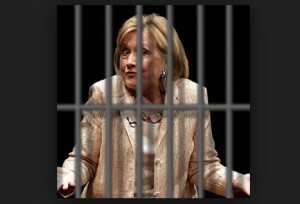 The major question concerning the Clinton Foundation is not that it has apparently become the largest unprosecuted fraud ever, but rather why it is taking so long to expose, prosecute and convict those responsible? Wall Street analyst Charles Ortel sat down to answer this and other questions. Two whistle-blowers had signaled their willingness to shed light on the charity’s alleged wrongdoings, if they are still alive on December 5. The Clinton Foundation’s allegedly fraudulent activities are likely to come under the spotlight on December 5, 2018, when United States Attorney John Huber, appointed by former Attorney General Jeff Sessions, is due to testify about his probe into the organisation. Meanwhile, it was reported that two whistle-blowers had signalled their willingness to shed light on the charity’s alleged wrongdoings. Sputnik reached out to Wall Street analyst Charles Ortel, who has been conducting a private investigation into the Clintons’ charity for three years, asking him to comment on the developments. On November 15th,the judgement day for the Clinton Foundation is nearing, as the Clintons are unlikely to provide a comprehensive and undistorted report about their charity’s financial and organisational activities. Did they manage to release a truthful report on IRS Form 990 by the close of business on November 15, 2018 concerning its operations and financial results for 2017? Charles Ortel: No! In the United States, tax-exempt charities that raise relatively small amounts of money each year must register truthfully in most states where they solicit donations. Many of these states require that the charities submit an independent audit of their financial results and position, performed using accounting standards that are to be followed in the United States of America. The “audit” for Bill, Hillary & Chelsea Clinton Foundation does not compare supposed 2017 results to 2016 results on a consistent basis — a material defect. Worse, the work presented in the “audit” and the results submitted under penalties of perjury to tax and other government authorities rest on gravely deficient and so far uncorrected disclosures for the period of October 23, 1997 through December 31, 2009. As these figures overstate construction costs by tens of millions of dollars, and contain numerous material errors, no subsequent work (years 2010 through 2017) can be correct, absent comprehensive restatements. Even with restatements, there are substantial questions over whether any entity in the network of Clinton charities actually is validly “tax-exempt”. What are the major developments in the Clinton Foundation’s case? 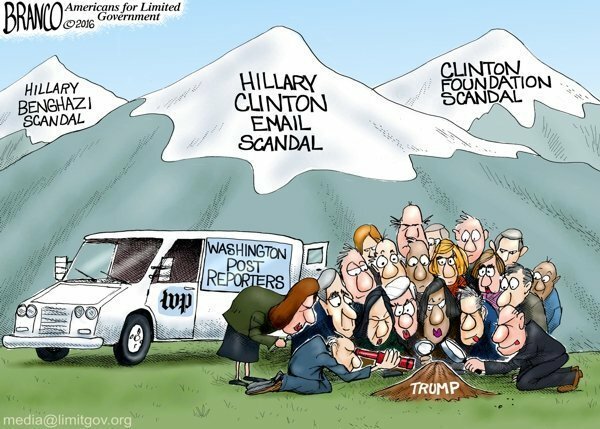 What did John Solomon mean when he said that on Monday we are likely to hear “breaking news” about a Clinton Foundation whistle-blower? Solomon dropped the hint that federal prosecutors assigned to US Attorney John Huber, the US attorney investigating the Clintons, had reached out to this whistle-blower on November 30th. Charles Ortel: John Solomon, a veteran investigative journalist now with The Hill, has been covering oddities around the Clinton Foundation charity network for more than ten years. Based in Washington, DC, John is well connected with current and former government officials and well-placed in media. According to former Attorney General Jeff Sessions, Huber has been evaluating whether prosecutions may be warranted for violations of laws including public corruption and charity fraud for months. A frequent guest on Sean Hannity’s Fox News television program, and on numerous additional shows, Solomon has been examining the Clinton Foundation case closely and seems to have developed ties to whistle-blowers who may soon testify in public, possibly before the House of Representatives, as soon as this coming Wednesday, assuming schedules are not adjusted following the recent passing of former U.S. president George H.W. Bush. In the view of many, Solomon and me included, the question is not whether the Clinton Foundation and those responsible for running it have broken state, federal, and foreign laws — the real question is why it is taking so long to expose, prosecute and convict the Clintons for crimes that are many times larger than crimes committed by former Congresswoman Corrine Brown (D-TX) and by former Congressman Steve Stockman, each of whom was convicted swiftly and punished harshly. On December 5th, US Attorney John Huber is due to testify on the investigation into the Clinton Foundation. What do you expect from this hearing? Can a whistle-blower’s report become a potential game changer or a catalyst in this probe? 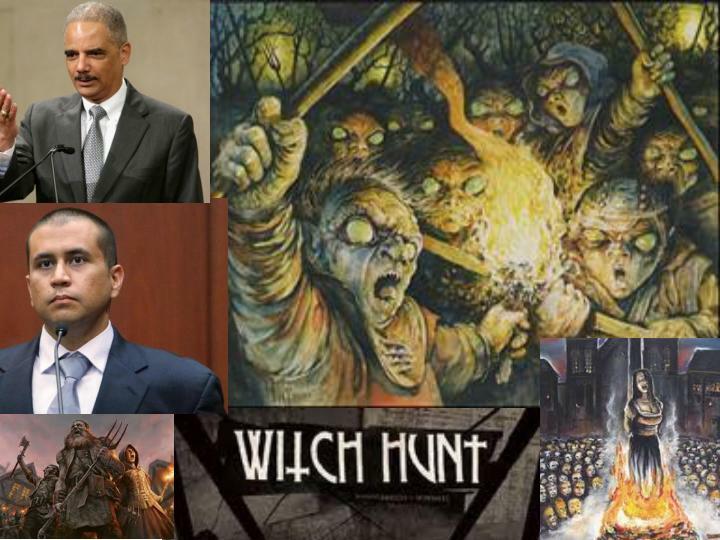 Charles Ortel: US Attorney Huber has had more than enough time to empanel grand juries and then try to obtain indictments against many persons for frauds that appear evident in Clinton charity records that have circulated, uncorrected, in the public domainfor 20 years. If the scheduled hearings proceed, we may learn that Huber and his team have done little to educate themselves concerning the Clinton “charities” and their public filings. Should this prove true, many who care about protecting the vital and active U.S. charity sector will become even more outraged than we already are. Alternatively, we may discover that Huber (and others) are making progress; however, if active criminal investigations are ongoing, the US system limits the flow of information (normally) to the public until indictments are issued and proceed to trials. I know enough about the public filings of the Clinton Foundation, and about other potential charity frauds that have been prosecuted successfully to believe that Solomon and his whistle-blowers can offer explosive new information that certainly should shake off apparent lethargy, so far, at the IRS and Department of Justice to hold many powerful people accountable for their longstanding criminal activities, including conspiring to obstruct justice. On Friday, Richard Pollock of The Daily Caller reported that a theoretically protected Federal whistle-blower had been subjected to a massive, overwhelming search of his home and possessions by a swarm of FBI agents. Unlike Hillary Clinton, this whistle-blower had voluntarily turned over evidence of public corruption and other crimes including the mishandling of classified information to the authorities soon after discovering this information. In contrast, this set of publicly available information (Parts 1 and 2 of FBI Vault concerning the Clinton Foundation) shows that Hillary Clinton and many associates apparently conspired to store and to mishandle classified information for many years on non-secure devices and servers. 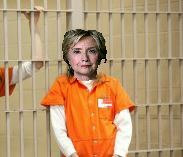 As Part 2 shows, Hillary Clinton was afforded great lenience as James Comey’s FBI and Loretta Lynch’s Department of Justice evaluated her case. Details are still flowing in and many questions remain but at first blush these recent actions against a federally protected whistle-blower seem egregious and suspicious, possibly designed to intimidate others who are trying to expose “deep state” corruption and criminal activities. 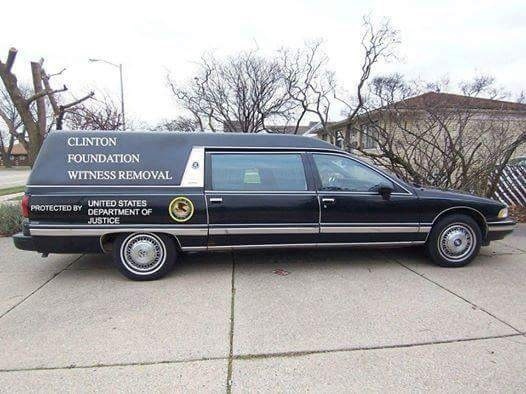 Failure to prosecute the Clinton Foundation and Hillary and Bill for their illegal actions will erode if not destroy whatever confidence the US public has in the DOJ. 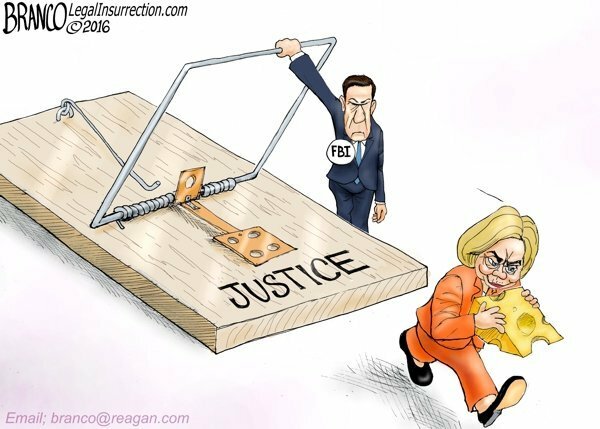 It will be indelibly clear to all that there are two standards of justice in the USA and that the elites are Too Powerful To Prosecute. The USA will be revealed for what it is: not a Republic, not a Democracy, but an Oligarchy created,ruled for the benefit of the few and the enslavement of the many. 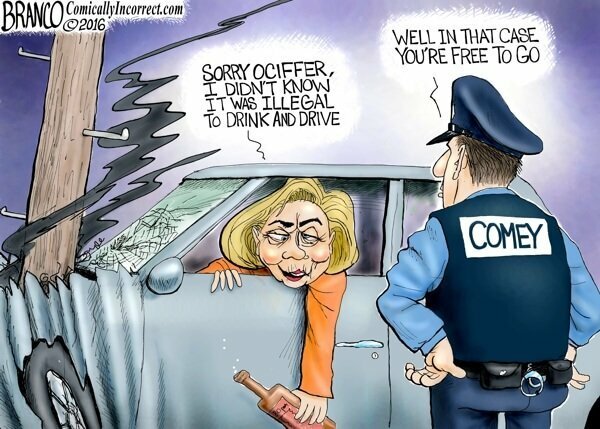 Half of Clinton’s ‘Charitable Giving’ Was Donated to Themselves! 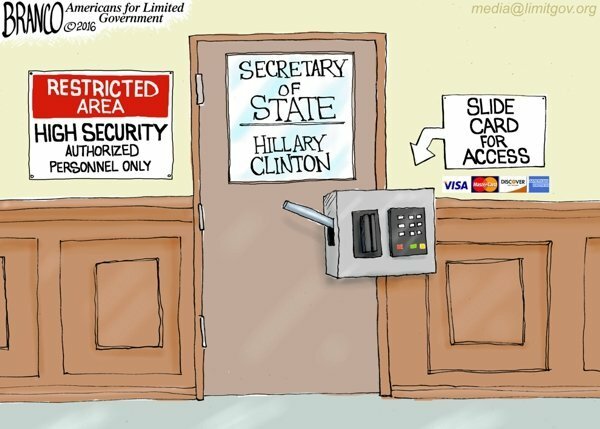 Posted in Tyranny and tagged Clinton, Crime.